In the 2019 elections, Darjeeling Lok Sabha seat is being viewed by almost everyone interested in politics as a litmus test to adjudge if the Gorkha aspirations of having a state of our own will prevail, or if the iron will of TMC chief Mamata Banerjee to obliterate the demand forever will deal a crushing blow to the same. In the muddled regional political atmosphere, which has gone topsy-turvy post the 2017 Gorkhaland agitation, it would take a political analyst of superhuman powers to predict who will win the seat. While the BJP sounds hopeful of retaining the seat, TMC is confident they will wrestle the seat away from the BJP, which has held the seat for 10-long-years, and has nothing to show for it. Chequering the political equation further is the lack of a strong regional political party that could decisively swing the elections one way or the other. Currently, for me though, no matter which candidate loses, the Gorkhas have already won, and here’s why. Not many may be aware that till date, Nepali – a language, which is one of the recognised national languages of India, and is included under the 8th Schedule of our Constitution, is not included as an optional paper in the West Bengal Civil Services (WBCS). While one can choose Nepali as an optional paper in the IAS exams, its non-inclusion was highlighted repeatedly in West Bengal Legislative Assembly, yet the powers that be have continued their defiant stand against Nepali language inclusion in WBCS. Instances of textbooks published by the West Bengal Secondary School Board discriminating against Nepali language have been reported in local media over the years. The most blatant of all being a Nepali medium book being printed in black and white, whereas books in other languages were printed in colour. After the failure of Gorkhaland agitation in 2013, the Trinamool Congress government had increasingly shown their disdain towards Nepali language, and there was a growing resentment against the same. On May 15, 2017, West Bengal education minister Partha Chatterjee made an announcement that “the government [of WB] will introduce three-language policy, the students will have to take Bengali compulsory as one of the three languages”. This same fact was reiterated by Mamata herself in a Facebook post dated May 16. The Darjeeling hills, Terai and Dooars, which have a very cosmopolitan mixture of Gorkhas – Nepali, Lepcha, Bhutia – Adivasis, Rajbonshis, Rabha, Toto, Mech, Bengali, Bihari, Marwari, Punjabi and almost every other major ethnic groups from various parts of India erupted in protests. Leading the protests were the Gorkhas whose lingua franca is Nepali. 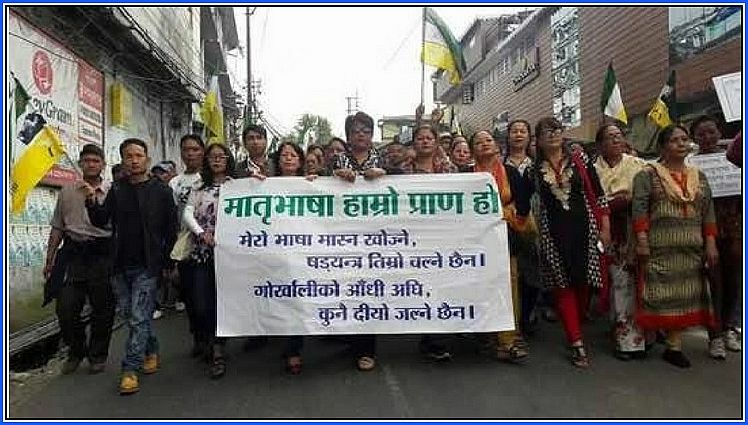 Protests against attempt at linguistic imperialism on the part of TMC government quickly snowballed into a full-fledged demand for separate state of Gorkhaland. Even quicker was the response of the state machinery, which violently crushed the movement. The Gorkhas, who were demanding the formation of a Gorkhaland state within the geographic, political and constitutional contours of India, were labelled as separatists and terrorists. The administration even said those demanding Gorkhaland have linkages to militants in Northeast and Maoists in Nepal, they didn’t bother mentioning which faction, though. Towards the end of September 2017, the Gorkhaland statehood movement had died a natural death, with movement leaders choosing to go underground. Ready at hand were second-rung leaders, who quickly stepped in to fill the void, not in leading the agitation for Gorkhaland statehood, but in handling the local Gorkhaland Territorial Administration (GTA) on behalf of the West Bengal government. Since then, there have been attempts at completely subverting any and all forms of expressing of the Gorkha identity issue in the region. As all of this was unfolding BJP and its entire leadership, including Prime Minister Narendra Modi preferred to keep a safe distance from the entire issue, and didn’t even utter a single word of sympathy, solidarity, support or outrage. It was almost like, for BJP, the perils facing Gorkhas was an unpleasant distraction, they could very well do without. The Congress and CPI (M), the other two main political parties in the region, did make some noise about everyone coming to the table and indulging in a dialogue to resolve the impasse, both were functionally indifferent towards the plight and sufferings of the Gorkhas. But the Gorkhas are a hardy bunch, and we endured all the hardships, with a smile on our lips and hope in our hearts. Today, as the election comes knocking at the door, lo and behold, the Gorkhas are a priority for all the political parties. Every major political party is trying their best to reconnect with the Gorkhas, whom they had, for all intent and purpose, forsaken and left for dead only a year ago. Today, three among the four major political parties have nominated a Nepali speaking individual as their candidate for the Darjeeling Lok Sabha seat. BJP has nominated Raju Bista, CPI (M) has nominated Saman Pathak, and Trinamool Congress has nominated Amar Singh Rai. Congress has nominated Sankar Malakar, who by the virtue of being a bhoomiputra from Darjeeling Lok Sabha constituency is fluent in Nepali. In fact on his very day after being given the Congress ticket, he headed to Kurseong and interacted with the locals, reminding them of TMC atrocities and BJP betrayals in the language majority of the people in the region speak – Nepali. Raju Bista is a political novice, but what swung BJP ticket in his favour was his Indian Gorkha heritage. The BJP is hoping that his ‘Gorkhaness’ will rub off against the unpopular anti-Gorkha stand of TMC during the Gorkhaland agitation in the region and help their candidate to shine. Their secret weapon, his mother tongue, is the same that of the shared lingua franca of our region – Nepali. Saman Pathak comes with years of experience in politics; in fact, he is one of the most experienced candidates around. His father, Anand Pathak, too, has represented Darjeeling Lok Sabha seat in Parliament, and he was himself a member of Rajya Sabha previously. His mother tongue, too, is Nepali. As for Trinamool Congress, which wanted to impose Bengali across West Bengal, they didn’t move even a single paper in that regard after the protests against their attempted linguistic imperialism broke out in Darjeeling hills, Terai and Dooars. What is almost ironic is that TMC that brutally crushed down the demand for a land of our own is desperately trying to project their candidate Amar Singh Rai as a son-of-the soil Bhoomiputra. The very same TMC that had labelled Gorkhas as being separatists and terrorists, is today talking about protecting the IDENTITY of the Gorkhas. From my count, we, the Gorkhas, have endured all that the time, government, system and bureaucracy had thrown our way, and survived. We are still Gorkhas – unchanged, and our indomitable spirit remains unconquered. Every political party that had sought to crush us, that had been indifferent towards our plight, that had been apathetic to our distress, that had been unconcerned towards our misery and suffering are today pandering to us. We, the Gorkhas, have survived, and no matter who loses the upcoming elections or wins, we shall thrive.